After another trip to Austin, I'm officially obsessed with Round Rock donuts. Especially when you can get them hot and fresh super early in the morning like we did before our 8am flight. We drove there in the pitch dark of the early morning hours to get a couple boxes to bring home. And it was well worth it. Warm, soft with a slight chew, these donuts are super addictive. Do yourself a favor and make sure to visit the next time you're in Austin! After all those donuts, I still had a craving for more. So I decided to make donuts, but with a holiday twist. 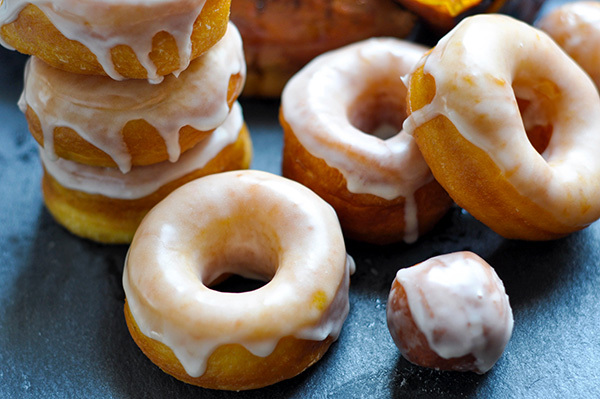 Sweet Potato Donuts with a Maple Glaze. If you're looking for the perfect Thanksgiving Day breakfast. This is it! Yeast donuts are basically the only donut I eat. I can't get over how light and fluffy they are. They do take some extra time due to the proofing process, but for me its totally worth the wait. Cake donuts just don't satisfy me the same way. Cake is so heavy, I can only eat one...and who just wants to eat one donut? 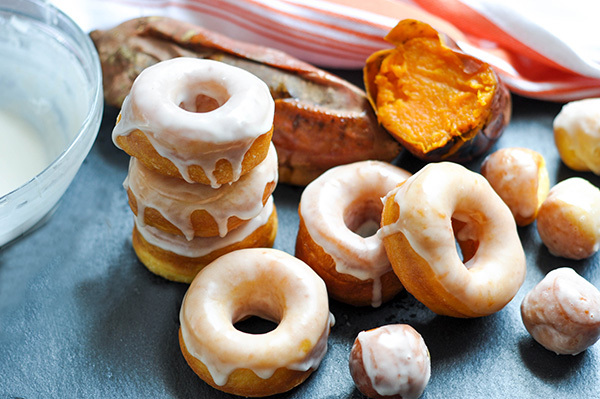 These donuts start with mashed sweet potato, so the night before I baked a whole sweet potato to make sure I had it ready for my morning fry. Score a cleaned sweet potato with a sharp knife and bake on a foil lined baking pan at 425F for 1 hour. The sweet juices come oozing out and you are perfectly ready to be mashed for this recipe. I wrapped these in plastic wrap and placed in the fridge to be mashed in the morning. The dough is basically a one bowl recipe with the exception of melting the butter with the milk. Once everything is prepped, you can throw it all into a stand mixer and knead for about 10 minutes. 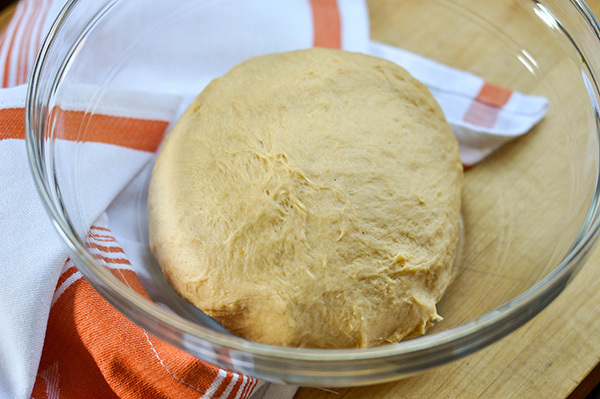 Allow this beautiful pale orange dough to proof. Once proofed, punch it down and turn out to a lightly floured board. Roll it out to about a 1/2" thickness and using a donut cutter, I used a 4 inch cutter, cut out our donuts. Gather the scraps together, roll and cut until all the dough is used up. Allow these to rise for 30 minutes. While they rise, heat your fry oil. Place the oil in a heavy pot and heat on medium high till it reaches 350F. Once it reaches 350 reduce the heat to medium and you're ready to fry! Gently drop the donuts in the hot oil and fry on each side till golden brown, about 30 seconds to a minute on each side. Adjust the heat accordingly if they start o brown too quickly. Place hot donuts on a wire rack to cool. Allow the donuts to cool slightly before dipping into the glaze, otherwise it'll melt right off and thats just not cute. These donuts are best eaten the same day. And so so good when they're warm! Enjoy these for Thanksgiving breakfast or honestly anytime. Donuts aren't as intimidating once you give it a shot, and I always think they're definately worth the effort! Mix together the warmed milk, butter, sugar, and sweet potatoes till well combined. In the bowl of a stand mixer add the milk and sweet potato mixture, yeast water and flour. Mix with a dough hook attachment. Once combined, allow to knead for 8-10 minutes. The dough will be soft and tacky. Allow to proof for 1 1/2 hours. Once proofed, punch the dough down and roll out to about 1/2 inch thickness on a well floured board. Cut the donuts out using a cutter and place on a parchment lined baking sheet. Allow to rise for 30 minutes. Heat the oil on medium high in a heavy bottom pot till it reaches 350F. Once it reaches 350F turn the heat down to medium. Drop the donuts in two at a time and fry for about 1 minute or until golden brown. Flip and fry till golden brown on the other side. Remove donuts onto a wire rack to cool. Make the glaze: Whisk Powdered sugar with Maple syrup till combined. Add milk to thin out to the right consistency. Dip hot donuts into the glaze and allow to cool slightly before devouring!